Maruf completed his bachelors and masters at Georgia State University. 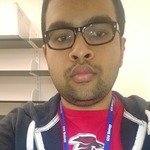 He was the iGEM graduate advisor at GSU in 2014-2015. Afterwards, he became a lab coordinator at Emory University in the department of Rehabilitation Medicine and is looking forward to enrolling in a Neuroscience graduate program in 2017.